An experiment at Tohoku University (Japan) in 2008 laid the foundations for research on 'spin caloritronics' – a field that aims to develop more effective and energy-saving data processing in information technology. Since then, many new spincaloric effects have been studied, but the key experiment in Japan could not be replicated. Researchers at Bielefeld University's Faculty of Physics have now found an explanation for this. They have published their findings in the journal Nature Communications. By applying a new measurement method available at major research facilities, they have also extended the experimental repertoire in spin caloritronics. These results can be found in the journal Physical Review Letters. As well as having an electrical charge, electrons possess an intrinsic angular momentum, called the electron spin. This spin generates a magnetic momentum and influences the spin of the neighbouring electrons in a solid state. In some materials, this can be used to transmit magnetic signals through a solid state without the electrons themselves moving. Because this does not involve the transport of an electric charge as in an electric current and it is also the spin that is passed on as information, the procedure is called spin current. 'Because the electrons themselves do not move, passing on the signal generates less heat. That is an advantage over electric current,' says Daniel Meier, a doctoral student in the 'Thin Films & Physics of Nanostructures' research group headed by Professor Dr. Günter Reiss. 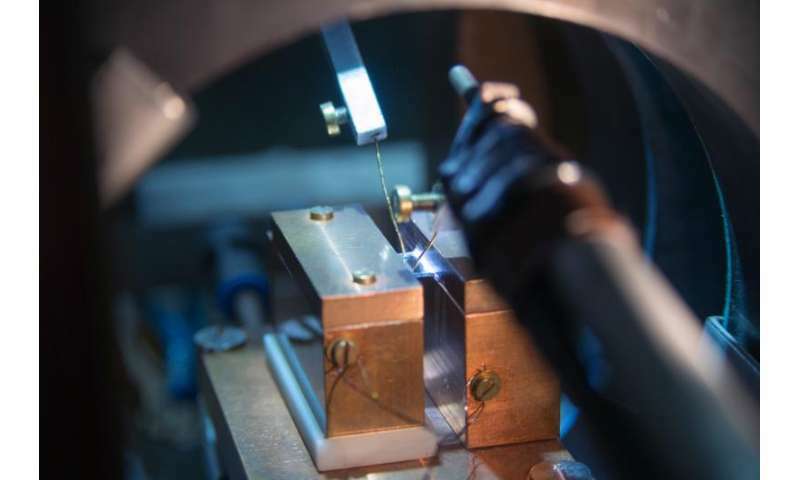 The scientists at Bielefeld are generating pure spin currents in magnetic materials that do not conduct electric current – so-called magnetic isolators. They are doing this with thin magnetic films made of nickel ferrite or iron garnet. 'Just as you can use electric current to build up an electric voltage in materials that conduct electricity, you can use a spin current to build up a spin voltage in magnetic isolators. This is called spin accumulation,' is how Dr. Timo Kuschel describes the parallels between classic electronics and spintronics. Kuschel is responsible for the spin caloritronics team in the research group headed by Günter Reiss. In the reported experiment, the team has now shown that thermal spin currents can be generated through differences in temperature. However, their explanation and their effect differ from what was originally anticipated. 'Nonetheless, the true effect is a very effective means of generating thermal spin currents. That is why we are naturally still very thankful to our Japanese colleagues for their research. It was the first experiment worldwide that got the ball rolling in the field of spin caloritronics,' says Günter Reiss. He is carrying out the experiments in cooperation with Universität Regensburg, the Walther-Meissner-Institute in Garching, and the Center for Materials for Information Technology in Alabama (USA). In addition, the researchers are also working on finding proof of spin accumulations. For this, they are using major research facilities such as the DESY (Deutsches Elektronen-Synchrotron) in Hamburg. 'The x-ray radiation generated in these electron storage rings is many times more intensive than x-ray sources in a university laboratory or a hospital,' says Christoph Klewe, who is doing his dissertation on the spin accumulation in bilayers of platinum and magnetic isolators. Previous experiments with x-ray radiation designed to detect spin accumulations did not produce clear results. Therefore, physicists at Bielefeld started searching for an unequivocal measurement method. 'With magnetic X-ray reflectometry, we have found a method that can also provide us with additional information compared to earlier approaches,' emphasizes Timo Kuschel. 'Magnetic X-ray reflectometry is still a new method and has yet to be applied in the field of spin caloritronics.' In cooperation with Osnabrück University, the scientists at Bielefeld University have published an article on this in Physical Review Letters.